Hungarian language – although Hungary is located in Europe – isn’t an Indo-European language (just like Finnish, Turkish, Estonian and Basque). 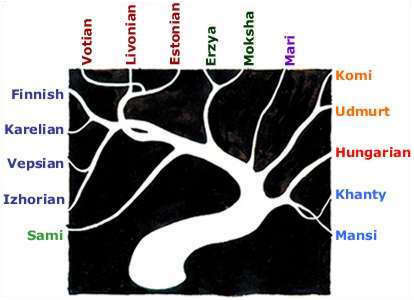 According to the officially accepted theories, Hungarian language belongs to the Ugric branch of the Finno-Ugric languages (which is the largest subgroup of the Uralic languages), however there are different other theories which suppose for example Turkic or other Asian relations. As Hungarian language is enough far from any other languages on Earth, it’s origins and related languages aren’t that obvious as Spanish and Italian are both Latin languages or Polish and Russian are both Slavic languages. So when we say that Finnish and Estonian are in the same (Finno-Ugric) language group as Hungarian, we have to mention that English, Russian, Italian, Persian and Hindi are in the same (Indo-European) language group too. Which means that these languages have something in common, some similar ancient words and the basic logic of the grammar, but are still way far from each other being able to catch even one word from the other language as a native of the other language. 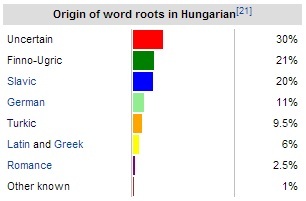 So this is the reason why even the fact that Hungarian belongs to the Finno-Ugric group can be questioned by some scientists. Anyway, the closest language to Hungarian isn’t Finnish nor Estonian, but the Khanty and Mansi languages, which – together with Hungarian – belong to the Ugric branch of Finno-Ugric languages. These languages are close to each other, but far from the Hungarian language not to understand anything from these languages as a Hungarian speaker. The most of the words with common roots are numerals, animals, plants and other words describing the nature. The speakers of these two languages live in the Ural Mountains, in the Khanty-Mansi Autonomous Okrug, Russia, and the number of the speakers are 12,000 and 3,000. Hungarian – with its 15 million speakers – is the largest Uralic language, what more, it makes up the 56% of all speakers of Uralic languages (Finnish 20%, Estonian 4.2%). I mentioned the alternative theories about linguistic relations above, which are sometimes ridiculous as there are theories besides the Finno-Ugric and Turkic relations about Sumerian-, Japanese-, Celtic-, Quechua-, Tamana- and Etruscan linguistic relation theories. So we can say that any languages that seem to be unique and different from other languages are claimed to be related with Hungarian language by someone. This is something like “Come on! Every language belong to somewhere and have related languages, we don’t believe we don’t have one!”. Theories about Turkic relations are the most viable alternative theories as Hungarian language has a lot of Turkic vocabulary even from before the times of the Ottoman Rule. Highly probable, that Hungarian language had come into being as some kind of mix of a Ugric and a Turkic language. Furthermore some scientists say that in these times the upper classes were formed by the speakers of the Ugric language while the lower classes were formed by the speakers of the Turkic language, so we also can speak about a mix of two different folks. As a proof, they say that while other tribes always had one totem, Hungarians had two: the Miracle Stag and the Turul (Saker Falcon). The stag might be the Ugric people’s, while the Falcon might be the Turkic people’s totem. It also can be a proof, that Hungarians have two names, one comes from Ungar (which might be the self-determination of the Ugric people) and the other is Magyar (which might be the self-determination of the Turkic people). The reason why Hungarians call themselves Magyar, while in most of the languages they call the Hungarians Ungarisch, Hongrois, Węgierski or other words that derive from Ugor is that these people first came contact with the upper classes. In Turkish and Slovakian Hungarians are called Macar and Maďarský, because they first came contact with the people themselves. See table below about the name of Hungary and Hungarians in different languages. After Hungarians arrived to the area of today’s Hungary in the 10th century, Hungarian language was influenced by the languages of the surrounding peoples’, mostly German (as Hungary was under the rule of the Austrian Empire for some 400 years) and Slavic, slightly Turkish (as Hungary was under the rule of the Ottoman empire for 150 years), Latin and Greece (mostly scientific language). As you see, Turkish language influented Hungarian two times; one time before Hungarians arriving to today’s Hungary and then in the 16th century under the Ottoman Rule, so this fact makes harder to decide how much Turkic vocabulary Hungarian language originally had. As I mentioned above, that even the closest language to Hungarian is absolutely incomprehensible for Hungarian speakers, now I have to say that even the speakers of the farest dialects of Hungarian language are able to understand each other. Hungarian language is very unified, more than English and even more than Spanish. It has 10 (or 9) dialects of which 3 are completely located in the area of Romania (1 million Hungarians live in Romania), the remaining 7 (or 6) are partly located in Hungary and partly in several neighbouring countries. It’s an other thing that today in Hungary almost everyone speak the same standard language, some exceptions are very old people from little villages. In the neighbouring countries like Romaina, Slovakia or Serbia, where Hungarian minority is significant, they preserved they dialect much more as before the fall of the communism there was no (and couln’t be) connection between Hungarians in Hungary and Hungarians living in the neighbouring countries, they didn’t have Hungarian TV Channels, etc. So they didn’t learn the standard language, preserved their own dialect. In the last 20 years this thing has been changed a lot and is changing now, as now they are also watching Hungarian TV Channels and travel to Hungary. But anyway for example people from the area of South-Transdanubian dialect (3) inside Hungary speak most likely the standard language or the standard language with very few accent. On the other hand people living in the same dialect area in Serbia speak absolutely with accent. The same is true about the palóc dialect (5) in Slovakia and Hungary. Most languages use the international denomination of Hungarians and Hungary, which derives from the word Ugor or Ungar, while some languages use a variation of the Hungarian word for self-denomination: Magyar. Also some of the languages have both forms.